Has a fuzzy cat or dog warmed its way into your family and your heart? All the more reason to focus your annual volunteer and charity contributions on your local shelter, veterinary hospital, or animal welfare organizations such as the SPCA. Adequate funding is the one thing shelters need the most to keep essential services going. Because many are non-profit or government/community funded, animal organizations depend on the generosity of others to keep food in Fido's bowl. That is why animal fundraising, or what we like to call fundraising for Fido, is a cause that's close to our hearts. It doesn't take much effort to fundraise for those furry and less fortunate. It just takes a little bit of creativity and a lot of love. This fundraiser is held in the same spirit as the car wash, but instead of buffing and shining the bodies of cars, you'll be fluffing and scrubbing the coats of some mutts that might have done a little too much rolling in the garden. Perfect for a hot summer day, you know everyone is gonna get wet and have fun as volunteers help scrub the pups down. It's best to be near a building with a few water hookups for hoses, or erect a few kiddie pools or large tubs to serve as your doggie baths. Set up shop in a park or along a path where people frequent to walk their pooches. Necessities are brushes, dog shampoo, a source of fresh water, and towels – for you and Fido! When you go for a hike, it's always nice to stop on a hot summer's day for a cool drink and a snack. Well, Fido feels the same. Funds can be raised if you set up a doggie snack wagon that sells an array of dog toys, dog snacks, and bottled water. A few cookies for the owners would be a nice touch as well. Organize a fair devoted to pet-themed wares and services focused on the happiness and well being of your favorite furry friend. Invite local veterinarians, pet food stores, pet-related craftsman, and dog house architects to set up booths and sell their wares. Fido deserves a day at the spa just like any other hard working mutt. Well, who's kidding whom? 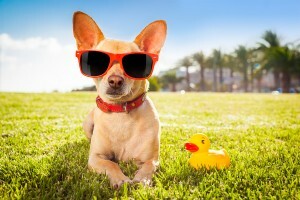 Fido has it pretty good, but this day of pampering can involve pups and parents. Offer front claw trimmings and shampoos for dogs, while mom and dad get their nails buffed (and maybe painted) by volunteers. Ask staff from a local salon to donate time for pet owners, and ask local veterinary workers to donate time to the dogs. Also called a Wag-a-Thon, this is a great excuse to get outside and enjoy local parks and recreational areas – as if Fido needs one. Ask pet owners to raise pledges to donate to the community pet shelter when they come out and walk Fido. This is the Oscars that honor the hard working SPCA, shelter, and veterinary staff and volunteers who give their free time to rescue, heal, and adopt out the most pets. This is a great community awareness event for your shelter, and it pays homage to those who work so hard, but get very little appreciation for their efforts. Set up an outdoor theatre and show pet-themed movies on an outdoor screen. Many city parks offer this type of evening entertainment for free. But this time, ask for a donation or gift of pet food from each audience member. All proceeds go to needy animal shelters. Hold bake sales at local pet shops, in front of grocery stores, at beaches, and park entrances – anyplace that gets a lot of people and dog traffic. But this bake sale will be focused on treats for Fido – dog cookies, bones, rawhide chews, and healthy dog food. He might need to go on an extra long walk after this one. Set up a large donation box at the local library, museum, school, animal shelter, or veterinary clinic to collect cans of dog and cat food for need shelters and animal hospitals in need. Look outside, its summer and most of your friends and neighbors are going out of town. But what do they plan to do with Fluffy or Fido? Offer an alternative to dropping them off at the nearest pet shelter with pet sitting services in exchange for donations to your local animal shelter.